Virtual tour of MyWebmarketing.eu-Says more than 1000 pictures! Are you a real estate agent, landlord, local owner or do you have great products in your shop? Potential customers will appreciate being able to visit your properties, cosy restaurant, hotel or restaurant from home at any time. A virtual tour of MyWeb marketing says more than 1000 images! Our Google Street View trusted certification, professional equipment and our know-how guarantee high quality and professionalism. This tour of the ‘ Roman city of Carnuntum ‘ is hosted directly on Google’s server. The tour was uploaded to the Google My Business entryfor ‘ Roman city Carnuntum ‘. This brings some significant benefits: Your virtual tour has maximum visibility for the public. Your entry or Your tour appears in Google Search, Google Maps and the Google StreetView app, you will be easily found in search results and reach high visitor numbers. And by the way-hosting a virtual tour at Google is free. Take a virtual tour of your new dream home-you can visit all the rooms from the comfort of your own home. This saves a lot of time and money on both sides. These tours are usually hosted by a special provider (or on your own web server). 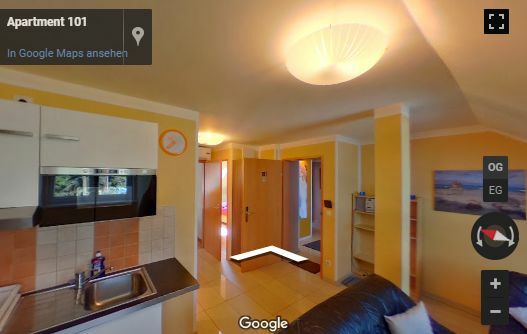 GOTHRU And TOURMAKE , for example, are two platforms where virtual tours ( trusted by Google StreetView trusted photographers) can be moderated and hosted. Real estate, hotels, restaurants, business premises and other indoor tours can be put online at short notice at any time-you retain full control of your virtual reality project. So-called overlays even allow reservations and bookings. So-called points of interest with a wide range of additional information are also possible. Take a romantic stroll in the footsteps of Empress Sisi. The virtual tour in the middle of the Vienna Forest is also hosted directly by Google. The tour was linked to the Google My Business entriesfor “Wien Museum Hermesvilla” and “Lainzer Tiergarten.” The number of visitors to this tour (so-called views) is absolutely record-breaking. Virtual tours offer great opportunities to real estate, restaurants, hotel rooms etc. Also to be able to visit day and night. Occasionally, we will also present virtual tours in our newsroom. Here, for example, a small tour of three panoramas. Dürnstein and the Dürnstein ruin are listed in the Wachau World Heritage Site. From the ruins of Dürnstein you have a magnificent panoramic view over the Danube Valley.